It seems every time we plan a trip to Southwest Virginia the weather doesn’t cooperate. This time would be no different. Following a week of stable, spring-like weather the night before we were to return to Rural Retreat to fish the temperature plummeted from 83 degrees to near freezing. And, our good friend ‘the wind’ returned. While the trout would likely have lockjaw it was a good opportunity to see if Fire Bait could convince the trout to bite anyway. With plans to go to Virginia vs North Carolina that evening (and the almost four hour drive incorporated with that) we only had a few hours in the morning to fish Cedar Springs, a well-known stocked trout stream near Rural Retreat. We arrived at 9 am when owner Jim Hilton told us it could be a tough day fishing due to the barometer change. He didn’t hesitate to tell us that there had been a tremendous amount of pressure on the stream and many of the trout were more than spooked. For those of you who have never fished the system, Cedar Springs is slightly different than a state stocked water. 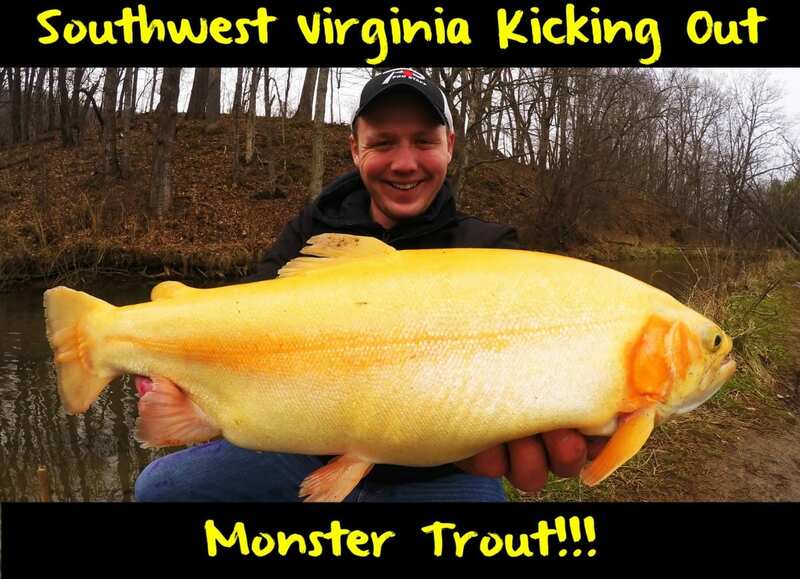 A fishing license is required, as it is in all public waters, but no trout stamp is required (which carries a hefty price tag for out of staters in Virginia). The big difference is that Hilton raises his own trout and doesn’t stock dinks, rather quality browns, brooks, rainbows and goldens over a one-mile section of private water on his ranch. There is a reasonable daily fee to fish. Meanwhile, who wouldn’t want to fish in a place that consistently has larger trout than state stocked systems and only costs about $30 more? Of course, some of you are going to rip us for fishing a stocked stream and tell us how easy it is to catch fish in a system like this. Keep something in mind, almost every trout fishery in the east is stocked. In fact, many of the wild trout you’re catching in various rivers and creeks were stocked as fingerlings prior. Cedar Springs sees a tremendous amount of pressure. Roughly 25 anglers fish this section per day. These fish see almost every lure, fly, egg and dough bait on the market. Before we made the first cast, Hilton told us he stocked a big golden rainbow that we wouldn’t have trouble spotting and had been in there for a while. He told us we’d be lucky to get it to bite and that dozens of other anglers spent the entire day casting towards it with no lucky. Ironically, we caught it on our first cast with Peach Garlic Fire Bait. In the few hours we fished our goal was to cast for the cycle. I had two buddies with me and both wanted to catch a rainbow, brown, brook and golden rainbow. (I didn’t fish.) One caught the cycle. The other caught three of the four and could have caught all of them, but around lunchtime we had enough footage and wanted to make a Bojangles run. Hilton was surprised that his browns and brooks ate the Pink, Garlic Salmon Egg and Peach Garlic Fire Bait. We weren’t. In those three hours we caught and released dozens of trout on the Fire Bait. This included two golden rainbows, one brown, three brooks and a few dozen rainbows. Keep in mind, these were the same trout that had lockjaw and that the 50 anglers that fished over the weekend didn’t catch. Fortunately, we released every one of them. Editor’s Note: To learn more about Cedar Springs or book a day at Hilton’s one-mile section of free flowing stream please visit http://cedarspringstrout.com or call 276-686-4505. The good news: Fire Bait is now available in Western North Carolina, East Tennessee, Southwest Virginia and West Virginia Walmart stores and at Bass Pro Shops.